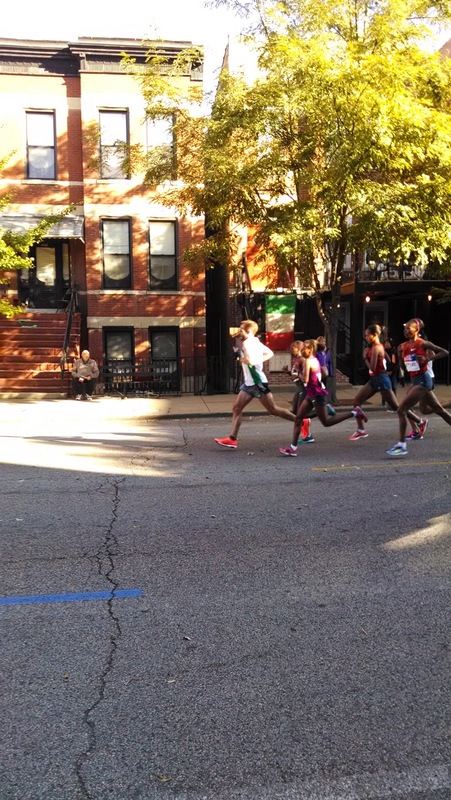 A few Sundays ago, I joined Amy and a few of her friends to cheer on runners at the Chicago Marathon. 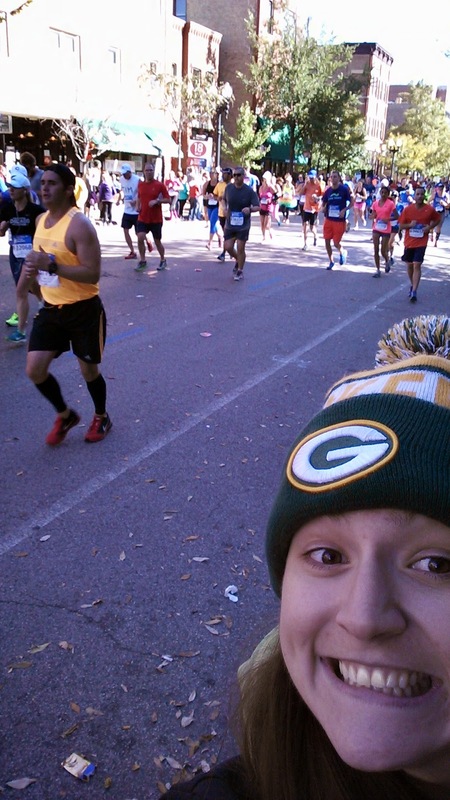 I love watching races and cheering on runners because it motivates me! I stayed at Amy's on Saturday night so we could carpool into the city on Sunday morning. And so I could sleep in a little bit plus I always enjoy hanging out with Amy. Since Saturday was the Ironman World Championship, I spent most of the day watching the live feed in Kona. It was a spectacular race and watching Rinny run down the leader after a 14-minute deficit off the bike was nothing short of amazing. While at Amy's we munched on chips and salsa and got some inspiration from "Spirit of the Marathon". If you've never watched that movie (it's on Netflix), you should, especially if you want to do a marathon. Early Sunday morning we headed towards Chicago with Dunkin' Donuts in hand. We were some of the first people down by mile 18 so we had prime choice of seats. Amy was very prepared with chairs, blankets, snacks, and a cooler. 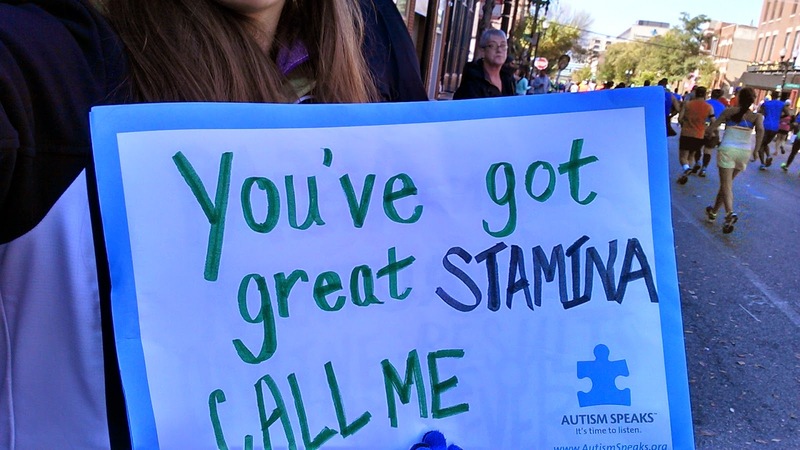 We were cheering for the Autism Speaks foundation and they provided us with signs, markers, shirts, and noisemakers! I brought my cowbell along too! 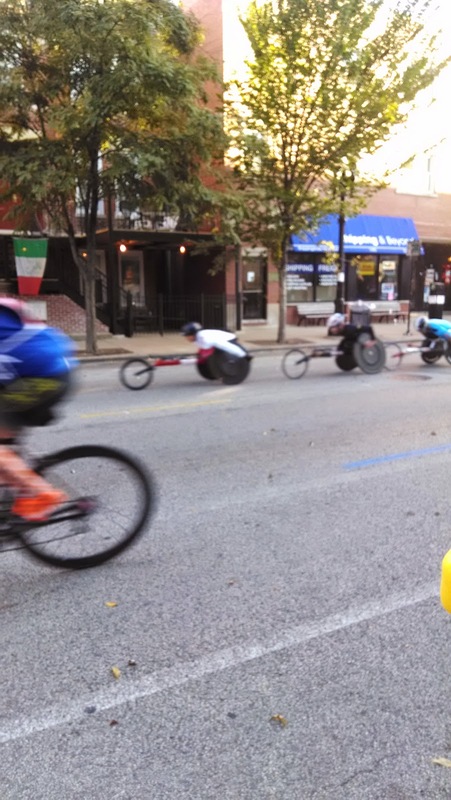 We didn't have to wait to long for the wheelchair racers to go flying by! They were impressively fast! It was also interesting to watch them draft off each other. In triathlon races on the bike you can get penalized for drafting--following the bike in front of you too closely. So I would venture to guess that these racers can get a lot of benefit from following behind another racer. It wasn't long after that when the next motorcade came speeding along. These cameras were focused on the leading men of the race. These guys can run an entire marathon at a pace faster than I can run one mile. Next up was the amazingly fast women. The elite people are always amazing and inspiring of course. But do you want to know what else inspires me? The regular old people who don't get paid to run or have sponsorships. The ones that work 40+ hour weeks and have families and other commitments and still find time to train for a marathon! The ones who are gunning for big PRs and those just trying to finish. When people tell me things like, "I could never do a marathon," I like to remind them that's it is not that they "couldn't", it's that they don't want to! It just takes a some determination and a lot of training! I got quite a few smiles from my sign! And a few comments too! One guy even came up next to me and told me he'd love to call me but it wouldn't work out because he is a Vikings fan. But people loved my Packer's hat too so I can't complain! Go Pack Go! The hat must have been good luck too because they pulled out a win that afternoon! 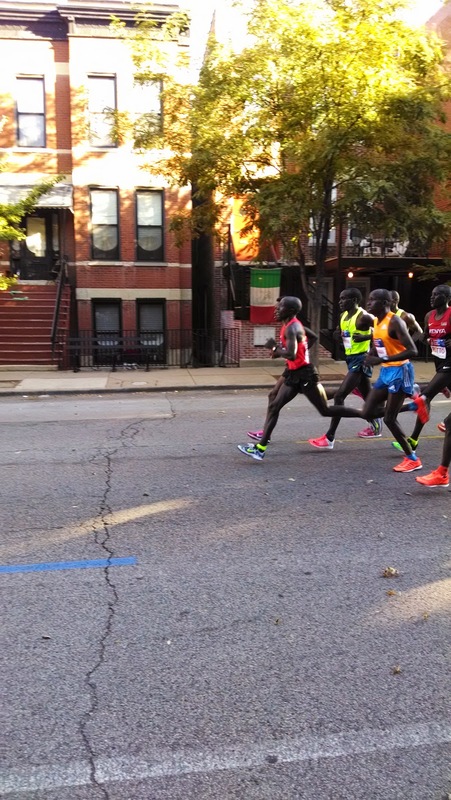 The Chicago Marathon is one of a kind! After watching thousands of runners pass me by, I will admit I kind of have the bug to sign up for another one!